After a short period of stand down the Corps were ordered to be reformed in January 1947 as a part of the Air Defence of Great Britain and was reactivated in broadly the same layout and structure as at the end of WW2, but with the addition of 31 Group Northern Ireland in 1953. Initially the Posts operated as they had, but plans were being rapidly out in place to provide posts with either brick built aircraft towers, or concrete pre-fabricated posts manufactured by the Orlit Company (makers of concrete pre-fab houses). These were either in the form of an ‘orlit A’ at ground level, or an ‘orlit B’ on stilts and were built between 1952 to 1955, and many can still be seen up and down the country. 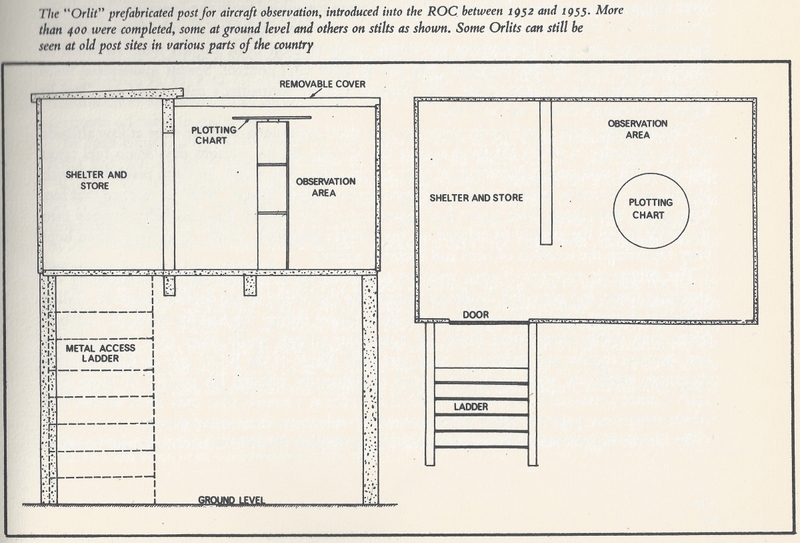 They consisted of a small covered area which formed the store and crew shelter where the telephone, flare pistol, and other post equipment were stored. Adjoining this was an open observation area with a central pedestal for the post chart and instrument from which aircraft plotting could be conducted effectively. Except this time the hostile planes being watched for were Soviet Atomic Bombers rather than Luftwaffe fighter. Over the years since the Corps were reactivated following WW2, it started to become apparent that manual aircraft plotting was becoming ineffective due to both the increased speed of aircraft (piston engined planes vs jet engined planes) and the advances in radar coverage and technology. The planes just couldn’t be plotted and tracked fast enough using the post instrument, and radar (the ROTOR project) coverage was rapidly increasing. 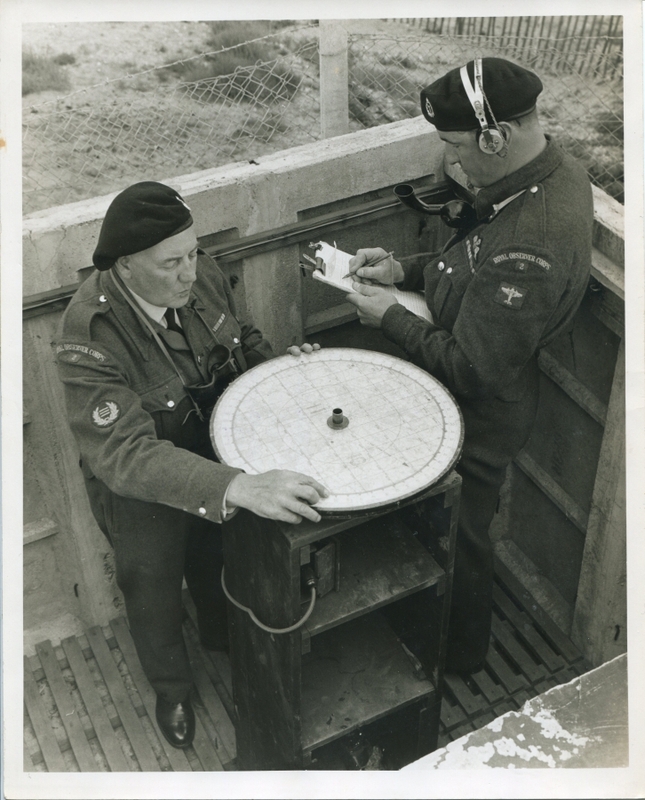 A short reprieve was achieved by the use of finger plotting, whereby the Observers took the post instrument off the chart table and literally used their finger to estimate the plot. Between 1958 to 1963 approximately 250 posts a year were built up and down the country around 8 miles apart. 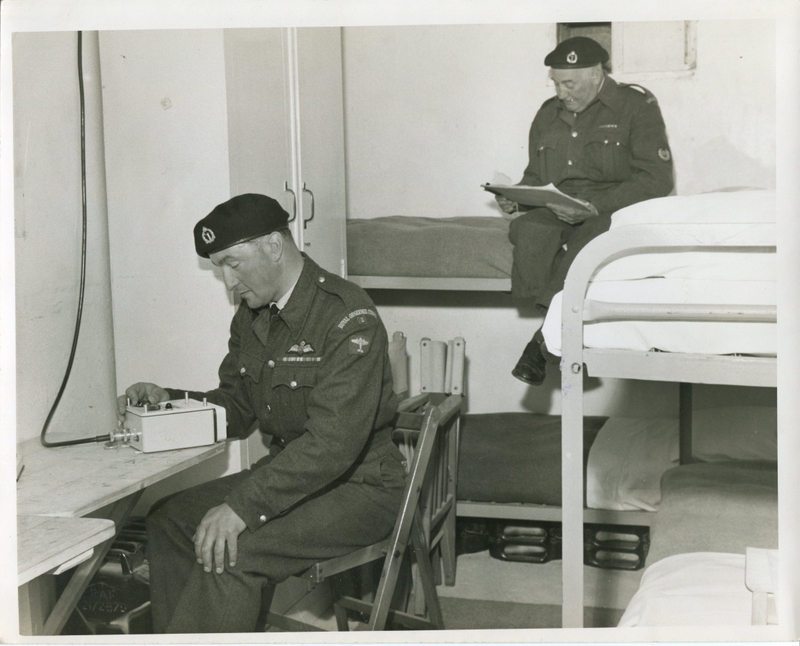 In some groups newly designed surface and semi-sunken Group Control buildings were built, while in others ex-RAF sector operations rooms or anti-air operations rooms were acquired and re-fitted for Corps use. 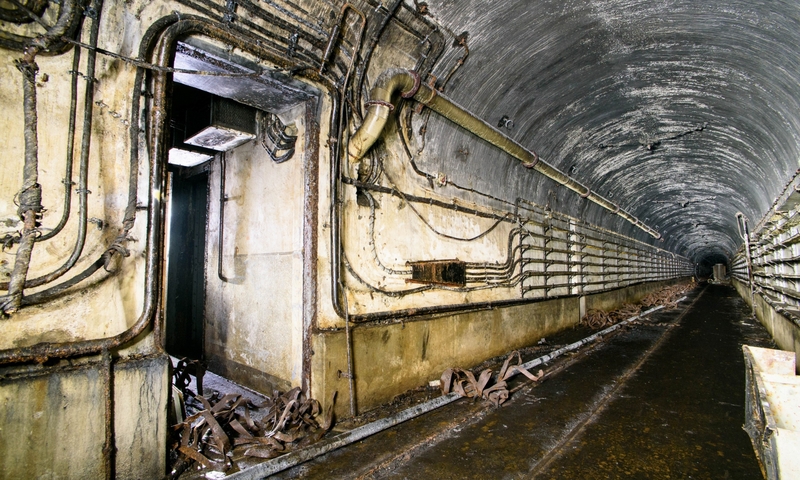 This building project took the Corps to 1563 underground posts and 31 protected Group Controls (one for each group). 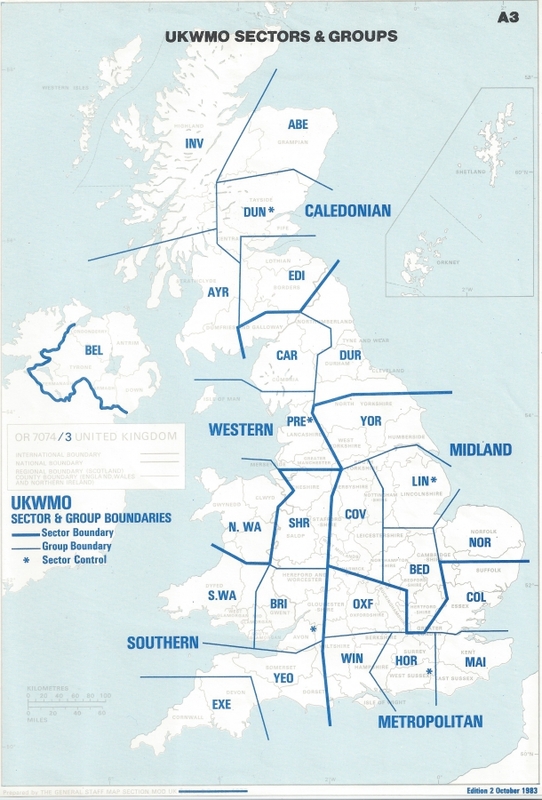 In addition, there were 5 UKWMO Sector Controls (Metropolitan, Midland, Southern, Western and Scottish) which administered larger areas comprised of 5 groups, these Sector HQ’s were co-located in existing Group Controls. It was in 1957 that the Home Office created the United Kingdom Warning and Monitoring Organisation (UKWMO), the headquarters for this organisation was in 3 Group Control in Oxfordshire. The UKWMO was primarily staffed by salaried and volunteer ROC personnel, who acted as the UKWMO ‘field force’ but it also had a small staff of its own, including Sector and Deputy Sector Controllers who were embedded in the ROC Sector Controls and scientific officers who made up the Warning Teams in the Sector Controls. This organisation was primarily tasked with 1) warning the public of impending nuclear attack (the 4 minute warning), 2) confirmation of a nuclear strike, 3) warning the public of the approach of fallout, 4) providing a scientific assessment and details of nuclear bursts/fallout to the UK government and our NATO allies, 5) providing a post-strike meterological service. You can read more about the UKWMO here. The Corps had a number of reorganisations during the Cold War. The first occurred in 1962 when the original 40 ROC Group Controls were reduced to 31, mainly as new protected accommodation came online but also due to spending cuts. Between 1968 and about 1973 more reductions took place as a result of further Civil Defence spending cuts and around 690 underground posts closed, 6 Group Controls shut and the numbers of part time staff were halved, and one sector was merged. This left a total 873 underground posts, 25 Group HQ’s, and 5 Sectors operational staffed by about 12300 Observers. Various posts were opened and closed during this time due to localised problems (flooding, vandalism, land owner disagreements etc) but the numbers stayed relatively consistent. During 1988 the Government conducted a review into the Air Attack Warning of Great Britain (which included the ROC). They concluded that it was expensive to run, and more modern equipment and automatic monitoring would be a more effective approach. It was noted however that these changes would take a long time to implement so the Civil Defence and ROC apparatus of the UK would continue to operate for some time yet. However on the 9th November 1989 the hitherto unthinkable happened and the Berlin Wall ‘fell’ with the East German regime removing the previously restrictive border controls. This effectively marked the thawing of the Cold War and the start of the end of Communism. Initially it was thought that the Corps would continue to exist but in a much reduced size and operating the new automatic equipment networks. This did not come to pass and the Home Office communicated to the Commandant ROC on 1st May 1991 that the Corps would be stood down, this was not to be communicated to ROC personnel until it was announced officially in parliament on the 10th July 1991 – however word got out very quickly via the media and most ROC personnel learned of the Corps stand-down this way rather than through the organisation itself. This caused some resentment as it was believed that the stand-down was covered up by ROC HQ, which it in fact wasn’t. Training ended in the same month, and by 30th Sept 1991 all volunteer Observers were to be stood-down with the exception of several hundred Nuclear Reporting Cell personnel (who would continue to serve until 1995). Full-time staff continued on until March 1992 at which point they were effectively made redundant.